Vital community services that address basic needs for shelter, food security, health care, and child and adult family safety, often referred to as the safety net, have traditionally been funded primarily by the government (federal, state and local). As a society, we have come to rely on this “social contract” with our governments for those core services. Heretofore, funding has been erratic but generally adequate and has been supplemented by support from individual donors, charitable foundations, corporate and business interests and community-based organizations. The current worldwide economic recession, the increase in pandemic and chronic diseases, the aging of the population and the continuing public debate about how much the government should contribute to support the population, have triggered a significant change in the availability of and demand for core safety net services. 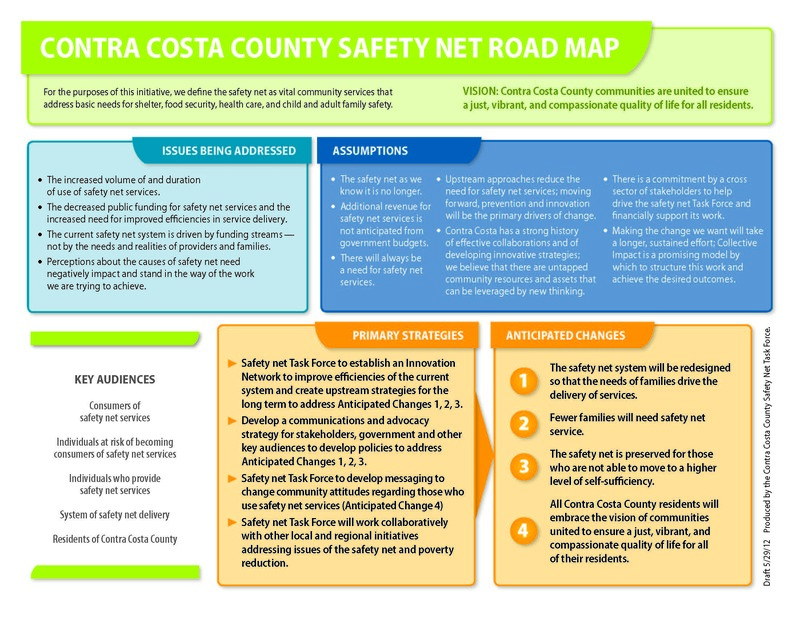 Contra Costa County’s reliance on diminishing federal and state resources, declining property and sales taxes and the increasing pension and retirement costs incurred by the county make these safety net funding shortages particularly acute in Contra Costa. At the same time, there are a variety of “community assets” available, including the commitment, expertise, resilience and experience of those who provide safety net services as well as those who utilize them. As local stakeholders (business and community leaders, service providers, advocates and funders) committed to improving the well-being of our residents, we are examining how core support services are funded and delivered in our community. Stronger collaboration between the government, for-profit and nonprofit sectors is critically important in determining the allocation of available governmental funding, as is the continued development of the partnership between community-based organizations, for- profit businesses and public social service providers. Determining how to envision and perhaps reinvent the safety net of services that a healthy region must offer will take ongoing dialogue, shared decision-making, collaborative funding strategies and the discipline to take the long view. 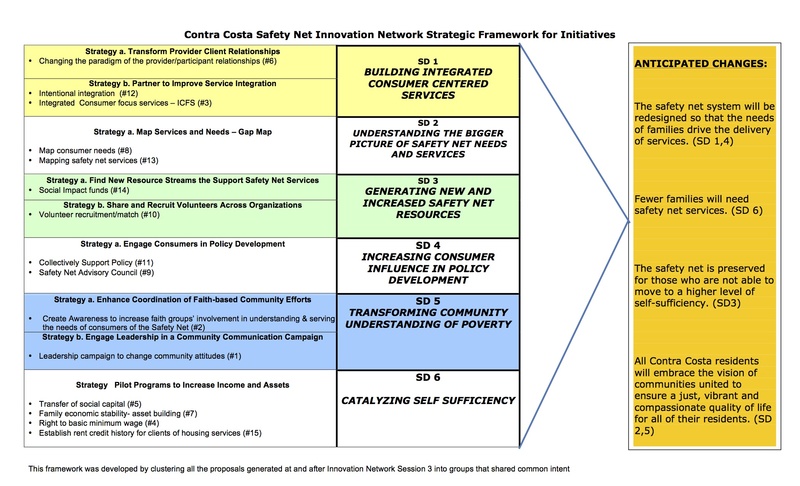 The goal of the Innovation Network is to bring together consumers of safety net* services with other stakeholders from businesses, non-profit community organizations, faith based organizations, foundations, government, and service providers to discover new short and long-term solutions to the challenges of our current safety net. Participants will generate concrete actions that they will commit to enact, as well as recommendations to the Task Force that will be considered for collective action. In this challenging economic climate, where traditional approaches to providing a “safety net” are insufficient, participants will be asked to look beyond individual agendas in pursuit of the common good, rethink assumptions, and generate new upstream solutions and action plans and create sustainable ways to ensure basic needs are met and a just, vibrant, and compassionate quality of life is available to all Contra Costa County residents.